The store, which will replace the Sexton Commons location, will feature many unique amenities including: store made pizza, burgers, sausage and kabobs; Asian hot foods bar; wing bar; trail mix bar; ExpressLane Online Shopping; and a drive-thru Pharmacy. 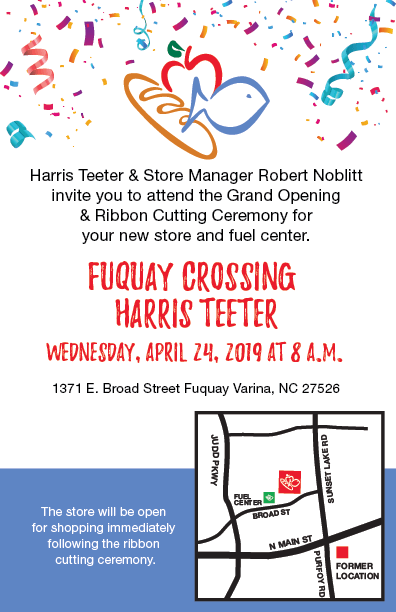 “We are so excited to introduce the Fuquay community to their brand new Harris Teeter and Fuel Center,” said Danna Robinson, communication manager for Harris Teeter. This location will also feature a Harris Teeter Fuel Center, which will offer customers $0.03 off per gallon every day with the use of a VIC card. The fuel center will open at 8 a.m. on Wednesday, April 24 following the ribbon cutting. During grand opening weekend, shoppers can take advantage of a special $0.20 off per gallon discount April 26-28, 2019. Normal fuel center operating hours will be 6 a.m. – midnight and 24 hours at the pump. Shoppers can redeem Harris Teeter fuel points for cents off the gallon at the fuel pump of any Harris Teeter Fuel Center or BP station. For details on earning and redeeming Fuel Points, please visit harristeeter.com/fuelpoints. Pharmacy Hours: Mon.-Fri. 9 a.m.-8 p.m.; Sat. 9 a.m.-6 p.m.; Sun. 11 a.m.-6 p.m.